Below is an application that was developed by an Aphelion™ users in the field of Material Science. The image is courtesy of ESRF Grenoble, INSA de Lyon, GEMPPM, and Ecole des Mines de Paris. The goal of the application is to extract volume fraction of zircone grains in aluminum, to compute grain sizing and determine neighbor distribution, working on the 3D volume. In the past, most of the 3D analysis were performed using the set of 2D sections of a 3D volume. Nowadays, thanks the processing power of computers, and the quality of sensors, it is possible to deal directly with 3D images. Below is the description of a very innovative technique based on 3D Morphology and 3D Image Understanding to compute grain sizing and neighbor distribution, two analysis which can only be performed on the 3D data. The image is acquired using a X-Ray micro-tomograph with an advanced sensor. The computation of the mean value of the binary image gives the zircone volumic fraction. Since the contrast between the two phases is good, a simple threshold is applied to extract the zircone phase. Since zircone particles are almost spherical, they all appear in the image as a stack of spheres touching each other. The use of the ClustersSplitConvex operator will help to segment all the spheres which are actually convex particles. The operator is based on the 3D implementation of the watershed, a morphological operator. To avoid biased measurements, a BorderKill operator is applied to remove all particles intersecting the edge of the image. A Miles-Lantuéjoul correction could also be applied to actually get unbiased measurements taking into account the size of the volume, and the operators involved in the process. The binary image is now converted into a 3D ObjectSet based on the 26-Connectivity. Note that cubic and cubic centered face grids are supported in Aphelion 3D. All spheres are now perfectly individualized. A set of measurements based on the shape are computed, such as the sphericity, and the intercept numbers in the main directions of the grid. 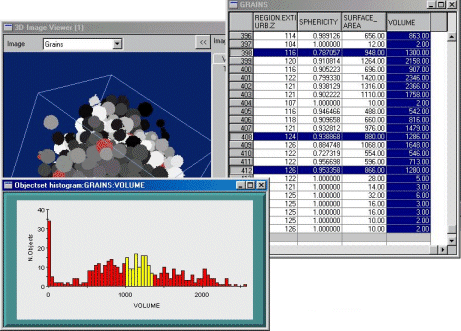 The size distribution of the particles is computed and displayed as an histogram, as shown in the chart below. 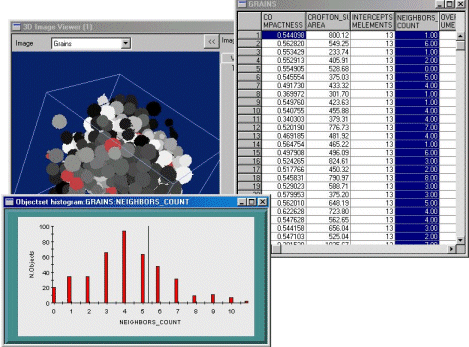 The last step of the application involves the computation of the number of neighbors for each zircone spherical grain. This number can only be accessed from the 3D data, using the notion of 3D ObjectSets. The classical method is based on the extraction of each sphere in the volume. Each sphere is dilated, and then intersected with the binary image. A geodesic reconstruction is then performed, and the number of components is computed. It has to be done for each grain, and it takes several minutes to run. We are proposing to use another technique, much faster, and based on the Aphelion ObjectSets. With the help of ObjectSets, the computation is no longer performed on pixels, but on 3D objects. Since objects are already individualized in an ObjectSet, and available as rasters, we perform a dilation on the Objects, with the condition that grains remain individualized even if they overlap after the dilation. The final result gives the number of overlaps for each grain, and is displayed in the standard Aphelion grid as a new attribute. This computation is very quickly performed since no pixel information is required, and it really proves Aphelion has superior capability than any other software when dealing with 3D images. The following chart gives the neighbor distribution for the Zircone image, and the grid shows the value of the neighbor attribute. As in the 2D version of Aphelion, message passing is available between the grid and the chart.